Hello people! 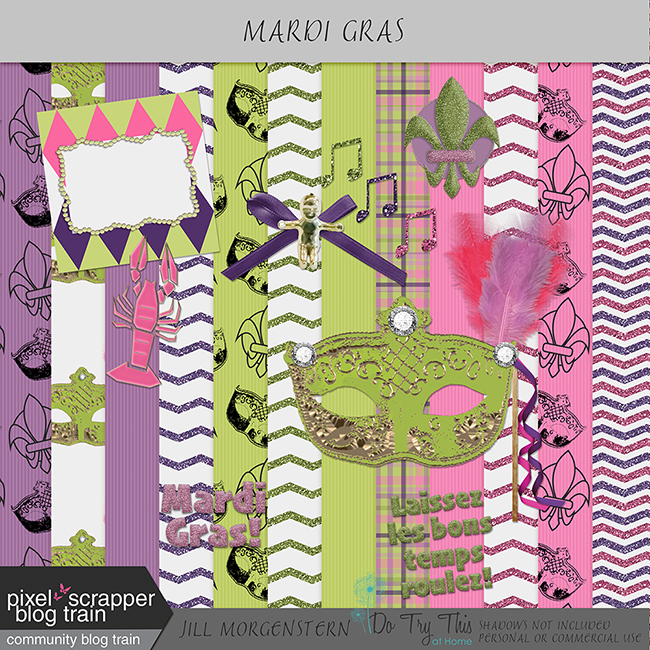 This month's Pixel Scrapper blog train theme is Mardi Gras. My portion can now be found here. I've never gone to Mardi Gras unless you count Mardi Gras Galveston, which totally should count. Mardi Gras Galveston has been going on since 1867 with a break in public celebrations from 1941-1985. And that is not really too bad considering New Orleans Mardi Gras only started in 1837. In any case I've never been to the New Orleans Mardi Gras. But I've been to The Houston Livestock Show and Rodeo, which is practically the same thing, plus cows. The point is that I only sort of semi knew what I was doing when I made this kit. I mean, I only semi know what I'm doing when I make any kit. But I think my quality control is improving. Free download has expired. It is now available here on Etsy! Thanks for the kit. Really enjoyed the history lesson. I never knew it started that long ago. Thanks for sharing your portion of this train. When I try to download it says it is not available?? What does it say exactly? if it says, "We're sorry, this file type is not currently supported," just ignore that and press the "download" button that's directly underneath those words. That just means it won't generate a preview because the file is zipped. I am trying to look into different places to host the downloads so that it's not so confusing. If it's something else, I apologize. Let me know what's going on and I'll get it fixed! Thank you very much for your part of this amazing blog train ! Thank You this is so pretty!